Heavy metal music and other forms of rock and rap have become increasingly popular in the Islamic world, often as a protest against corruption in government, according to a recent article in the “Chronicle of Higher Education” (July 4). 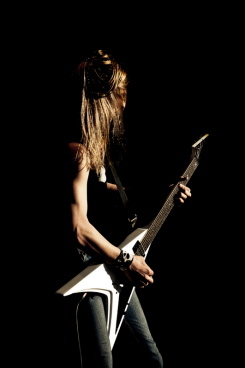 Heavy metal guitarist (© Andreas Gradin | Dreamstime.com). Mark LeVine, the author of a recent book called Heavy Metal Islam: Rock, Resistance, and the Struggle for the Soul of Islam (Three Rivers Press, 2008), writes that just as the raw-sounding music with angry lyrics found a hearing among disaffected American and British youth in the 1970s and 80s, this form of rock serves as a similar means of escape and protest in countries from Morocco, Pakistan and Egypt to Indonesia. LeVine, a professor of Middle Eastern studies at the University of California, adds that the music is different in Islamic societies because it is often mixed with Islamic themes and music. For instance, in Morocco, which has the most Muslim “metalheads,” the music weaves together Sufi- and Gnawa (Moroccan blues-style Sufi music)-inspired rhythms with the “hardest metal around.” Other heavy metal musicians and fans in Islamic countries consider themselves “secular Muslims,” or separate their religious beliefs from their music and politics. Because Sufi practice and worship goes against the grain of the Saudi-inspired orthodox Islam in many countries, these musicians and their fans may face both religious and cultural restrictions. The Moroccan government has cracked down on its “homegrown metalheads.” At the same time, the Government has realized the popularity of the music and sponsored a metal festival organized by American evangelical Christians, according to LeVine. But metalheads in some countries have been arrested, jailed and even tortured for being “Satan worshippers,” LeVine adds. In a much publicized trial in 2003, the government court convicted 14 heavy-metal musicians of Satanism and undermining morality. After followers held rallied and appealed for French support, the government overturned the sentences. LeVine claims that despite fears of a crackdown, heavy metal and other forms of dissenting pop music and its performance in public is helping to create a new social space in Islamic societies where politics, religion and identity can be discussed.